This vintage handcrafted honey caramel suede purse has a 29" long buckle shoulder strap. 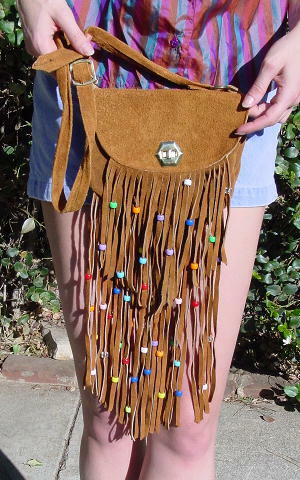 It has a front flap closure with 6" fringes with some of the fringes having a colored bead. 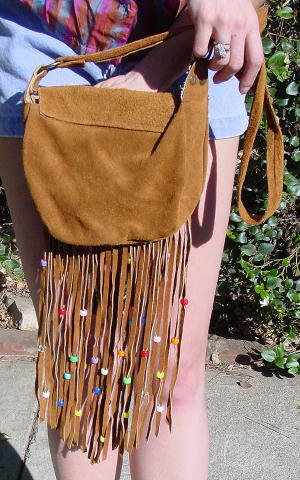 The bottom of the purse has 13" long fringes, some of which also have a colored bead. It's from a South American model, and was also used in a photo shoot. It looks great with the Guatemalan fabric and leather belt.